India will have the highest number of youths in the whole world in the next couple of years and the participation of youth in the development of city has become very significant. 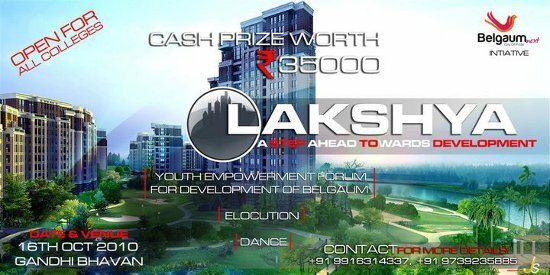 LAKSHYA is an initiative by Belgaum Next in order to encourage the youths to be networked and involved in the developing of Belgaum city. The purpose of LAKSHYA is to provide an opportunity for the youth to learn about real practice in social work in local communities towards strengthening of social knowledge, critical thinking skills, efficiency analysis for building up their attitude through potential young activists to involve in local communities and society development in Belgaum city in the future. Youth’s participation is very important for community and society because they will aware people about the strengthening of community empower and the use of effectiveness and sustainability for new generations. This activity will become a new model for youth community in the area and other areas to follow it and it also becomes new model action and sustainable activities. Belgaum is now marching with a tag of fast growing, redeveloping district with a population of approximately over 42, 07,264. Belgaum is exactly at the center between Mumbai and Bangalore. So, Stay a while and discover Belgaum……. Belgaum needs new solutions new ways of thinking. A proactive approach on the many challenges that the city faces in its drive to be a modern city on par with other cities in the world. A key area of focus that LAKSHYA will bring to fore would be on the issue of better infrastructure systems that will play a critical role in Belgaum’s development, since it constitutes the backbone, the nerves and arteries of the urban system. The theme of this event is based on the development of Belgaum city- It will be held at “Gandhi Bhavan” on 16th of October 2010.